Oh no! Wild Vocabulary Test appeared! Well it's a quiz over "Night", so Fighting would've worked better. There is a 1 in 8192 chance of finding a shiny vocabulary test. Oh Pikachu, you never let us down! I... think I took this quiz. I didn't take this test, but I just recently read this story in English class. It's a good thing it wasn't a rock type pokemon... Lord knows paper beats rock! How somebody can't answer a vocabulary quiz that is so simple?? english is not even my language and i know how to answer that! 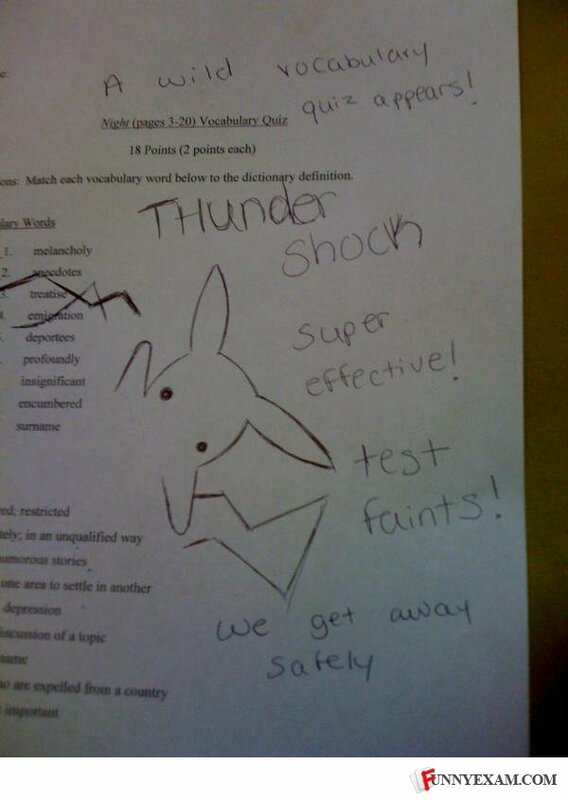 Who else thinks this is Ash Ketchum's test? PIKACHU DOES NOT EVOLVE FROM EXPIERIENCE PIKACHU EVLOVES WITH A THUNDERSTONE YOU WANNA BE POKEMASTER FUCKS. ...I read that book, /and/ took that quiz. Wat. Just wait Pikachu. You'd better level up if you want to beat L70 final exam! Its we "got" away safely, I cant believe you survivewild vocabulary test"! If you faint it, you don't see the "get away safely message." Learn your Pokemon! What's sweet and tastes like candy? Candy, now get in the van.